Hello everyone are you looking for Etihad Airways cabin crew jobs? then this article is also important for you to know the Etihad cabin crew salary and benefits. So, here you will get Etihad airways salary information and also, benefits and work roster details. Etihad flight attendant salary is the most attractive for these jobs. So, please check out the full details from the below. Etihad is the United Arab Emirates national airline. Just like Qatar Airways and Emirate, Etihad takes care of many things for you. However, Etihad is not as big as the emirate and has existed since 2003. You will be provided a shared apartment in Abu Dhabi and you will be taken back to your apartment from the airport. However, you should not forget that it can interfere with the feelings of your freedom; whatever you like, which you like, invite whenever you want; As your employer can easily check on you. You have to work hard, but it will give you many wonderful places to see, which the world has to offer. Your colleagues come from all over the world and corporate language is English. All the Etihad crew, ambassador of Abu Dhabi to their house, the United Arab Emirates has represented us, flying across the globe in Europe, North and South America, Africa, Asia and Australia, and taking care of traditional guests. Are there. Arabic summer and honor in the state fleet of new aircraft. 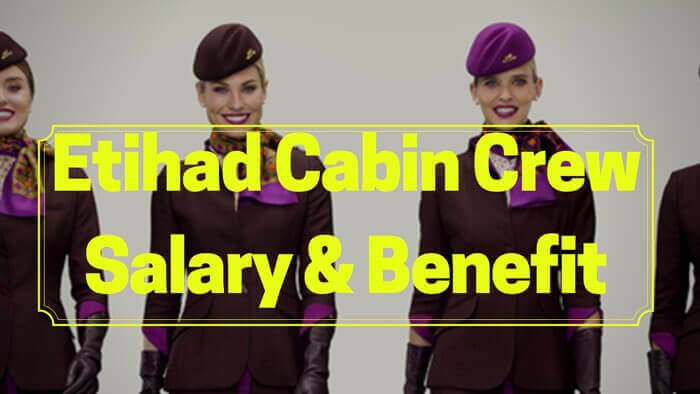 Etihad Airways salary information are in the bellow. I think it will help all the fresh candidate who wants to become a cabin crew. So, I requested to all please check this article till the end. You will get basic salary after probation AED 3640 and hourly pay is AED 44 which are most attractive in this airlines. Furnished apartment shared by Etihad shared. Transport to the airport before and after work. When you are living in a foreign country, then you are paid per hourly (mostly 2 to 16 dirhams ($3 to $6) per hour). This allowance comes with your salary (with one month delay). You fly all over the world, work on both long and short flights. After returning to Abu Dhabi, your roster is put together after giving you minimal comfort. After that, you are able to fly again. You will fly approximately 70-100 (mostly 70-80) hours per month. On the below, you will find an example roster. Note- if you want to check emirates open day for 2019 April please check the link and if you want to download a free sample resume please click on the link and if you want to make a premium resume from me you can mail your details on [email protected] it will cost you $3 and delivery time 2 days. Bellow are some important benefits that provide to their cabin crew along with the Etihad cabin crew salary. So, my requested is please check out the below information to know the details of Etihad Airways salary and benefits. You will get a tax-free salary which is competitive within the industry and reviewed on a regular basis. Free accommodation in a modern shared fully-furnished apartment, with your own private facilities. Everything is provided to ensure that you have a safe, safe and comfortable home in Abu Dhabi. You will get airlines transport to take from your accommodation to the airport for your flight duties and then to bring you back home again after your flight. Enter the special status of the Etihad swimming pool, health club, and fitness centers at no cost, and you can reduce your massage rates, beauty treatments, and hairdressing to look their best. You will get free private medical insurance and accident insurance or life insurance. Special discounts on restaurants, shops, hotels and leisure facilities in the United Arab Emirates and the region. So, I think this article will help you to get information about Etihad cabin crew salary, benefit, and work roster details. If you want to apply for Etihad Airways cabin crew online please check the details in the link. If you have any query please comment below or you can contact me on my Facebook page and YouTube channel for more information.